For over a decade now, superhero movies have been competing in an entirely unique challenge. It’s called: Do the Spider-Man origin/moral code story without actually using the phrase “with great power comes great responsibility.” For example, when Miles Morales comes close to actually uttering the forbidden phrase n Spider-Man: Into the Spider-Verse the Jake Johnson Peter Parker warns him not to finish the sentence or else he’s going to get punched in the face. Non-Spider-Man movies don’t have the luxury of getting or not getting to use the forbidden phrase, but they are equally challenged to make the idea behind the old axiom seem fresh. Failing the challenge earns an eye roll from some audiences, many of whom are young enough to have never known a world in which multiple live-action Superman, Batman, Spider-Man, X-Men, and even Iron Man movies didn’t already exist. There’s only so many variations on superhero origin stories, and there’s only so many ways to watch a costumed guy or gal learn there’s more to being a hero than material gain and temporary fame. Billy Batson (Disney Channel/social media star Asher Angel) – a 14-year-old orphan living in a Philadelphia foster home – is transported to a mysterious other realm by an aging wizard (Djimon Hounsou). 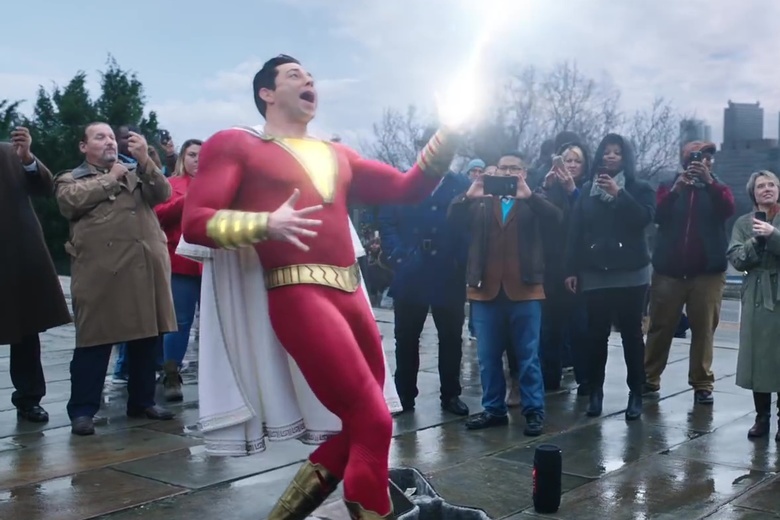 There, he’s granted “the wisdom of Solomon, the strength of Hercules, the stamina of Atlas, the powers of Zeus, the courage of Achilles, and the speed of Mercury.” Together, those mythological forces spell out the name Shazam, which becomes the trigger word Billy uses to activate his powers and morph into a Superman-like costumed adult (lovable Zachary Levi seamlessly mimicking Angel’s mannerisms). Well, thank you very much, Mr. Wizard, but, really, just what do you expect a 14-year-old to do with all of that? -Serve the world and fight against the demonic embodiments of the seven deadly sins infecting humanity, of course. Plus, there’s a mad scientist out there. Looks an awful lot like Mark Strong. He’s up to something, I bet. Huh. Cool. Cool, cool, cool. But, first, um, do you mind if Billy uses his adult body as a glorified fake ID to get beer and entrance into a “gentleman’s club” before starring in a series of viral videos showing off his superpowers? Because that’s totally what the Billy Batson of this movie does. Frankly, at his age, it’s what most of us would have done. Though largely spoiled in the marketing, these sequences with Billy unabashedly enjoying and exploiting his new superhero persona makes for some of the most effortlessly entertaining scenes in any recent comic book movie. This is due in no small part to Zachary Levi’s uniquely juvenile, but also purely innocent comic persona. Every time I hear Survivor’s “Eye of the Tiger,” for example, I will always think of Levi standing at the foot of Philadelphia’s “Rocky steps” and joyfully adding the lyrics “lightning powers from my fingers!” to the intro. However, if you’re starting to see the “…must also come great responsibility” part of this coming then congratulations, you’ve clearly seen a superhero movie before. Yes, ultimately, Shazam! treads familiar moral ground. The boy who can become Superman with a single sentence anytime he wants eventually learns his actions or inactions have consequences and that selfishness is a thing you have to leave behind when it could mean the difference between your loved ones living or dying. The film’s inevitable transition from “superpowers are fun!” to “superheroing is hard work!” isn’t as smooth as it should be. It mostly takes the form of Freddy (It’s scene-stealer Jack Dylan Grazer) – Billy’s friend and self-appointed manager – preaching at him. Which, sure, as the film’s resident superhero expert he’d be the one to explain this part of the rules. However, Freddy’s also the one who teaches Billy how to get the people he saves to pay him out of gratitude, and he’s also the one who goes on a crime spree with Billy where they rob ATMs to buy video games and other cool tech stuff for their room. To have him then throw Billy’s moral flaws back at him feels a bit sudden. Yet, Freddy has his reasons (I won’t spoil more). The action scenes grow a tad repetitive. The villain (Strong), who gets a surprisingly long origin story of his own involving a domineering father (John Glover), has all the same powers as Billy as well as a horde of CGI demons at his command. Naturally, he repeatedly overpowers our teenaged hero. When faced with defeat, Billy kind of just has one superpower trick up his sleeve to escape and he uses it over and over again at climactic moments throughout the story. It’s cool but overdone. It’s something you notice more as the film’s running time swells to a slightly-too-long 132 minutes. The villain’s plan is never entirely articulated. We reach a climax which puts key characters in peril and vaguely threatens the world but we don’t totally know how exactly things will play out of Billy loses. Not that this ever drag things down too much. That’s because Shazam! is an utter delight – Big meets Superman with a meta-Deadpool element thrown in since superhero-obsessed Freddy constantly points out the tropes. Director David Sandberg, promoted to the big leagues here after cutting his teeth on New Line horror titles Lights Out and Annabelle: Creation, has said his goal with Shazam! was to recapture the spirit of an old 80s Amblin movie, right down to including at least one scarier-than-you’d-expect sequence. Mission accomplished. There’s also a slight throwback vibe to old 90s blockbusters like The Mummy as well. Still, as a modern superhero movie Shazam! has to play the “with great power” challenge. It has the origin story part covered, but how do you add something new to the same old, same old part of the story where the guy in tights learns how to be a hero? The answer here is to lean hard into themes about family. Billy and Freddy come from a packed foster home which includes soon-to-graduate high schooler Michelle (Grace Fulton), video game-obsessed Eugene (Ian Chen), shy Pedro (Jovan Armand), and talkative little sister Darla (Faithe Herman), all of whom receive at least one spotlight moment in the story. By the end, Billy’s journey is to learn to embrace this new family and let go of his search for his biological mother. This storyline doesn’t exactly reinvent the wheel, but that’s never really Shazam!’s goal. It quite simply wants to be Big meets Superman with enough throwback vibes to stand apart from what Marvel Studios is up to these days. With Zachary Levi in the lead, it’s hard for them to ever truly go wrong. Remember when parents complained about DC releasing a Batman and Superman movie which was so dark they couldn’t really take their kids to it? Those people should feel heard now. With Shazam!, New Line and DC have made the most family-friendly live-action superhero movie in years, a truly PG-13 Deadpool with enough self-awareness to please the adults and enough superhero goods and family themes to speak to the kids. That’s more than enough to make up for a few flaws. Post-credits alert: There are two of ‘em, neither of which feature The Rock as Black Adam. The last one – which plays at the very end of the credits – has actually already been included in its entirety in the TV commercials. However, it still got a big laugh in the theater. Easter Egg Alert: Pay attention to the background during a fight scene in a toy store. Thanks to Shazam!, you can add Mark Strong (Green Lantern), Zachary Levi (Thor: The Dark World), and John Glover (Batman & Robin) to the increasingly long list of actors who have appeared in prominent roles in more than one superhero franchise. See also: Ryan Reynolds, Ben Affleck, Tom Hardy, Chris Evans, Michael B. Jordan, Michael Keaton, Michelle Pfeiffer, Nicole Kidman, Randall Park, Josh Brolin and on and on. Shazam! opens in theaters around the world April 5th. It’s not a genesis which is overly spelled out in the movie. It’s contained to just one line, but when a name sounds that juvenile it is helpful to know every single letter stands for something bigger.